2008 Virgin Mobile Festival Ticket Giveaway! 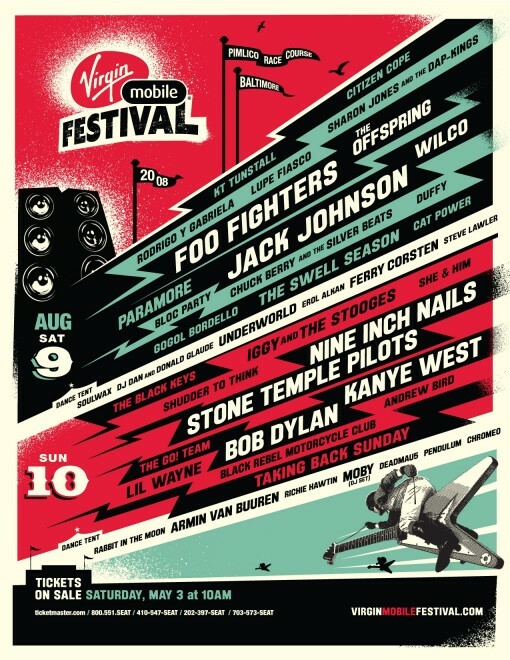 Hey, as you all probably know by now the Virgin Mobile Festival is taking place on August 9-10 in Baltimore, Maryland at the Pimlico Race Course (where Seabiscuit once ran). The weekend is jam packed full of music and will feature performances from such indie favorites as Andrew Bird, Cat Power, Gogol Bordello, Rodrigo y Gabriela, She and Him, Sharon Jones and The Dap-Kings, The Swell Season and Wilco. In addition, for those of who enjoy your rock a little more mainstream shall we say, the fest also has its fair share of big name acts on the bill including Bob Dylan, Kanye West, Nine Inch Nails, Foo Fighters and popular summer festival headliner Jack Johnson. Since it’s such a great looking lineup, I’m really excited to announce that I’m giving away a pair of general admission weekend passes (a $350.00+ value) to the Virgin Mobile Festival to one lucky person who emails me contests@bumpershine.com and tells me who their favorite artist performing at the festival is and why they want to go see them. I want to see Kanye West since I’m a night owl, and apparently, he is too. My favorite act performing at the 2008 Virgin Mobile Festival is Taking Back Sunday. I have been a huge fan of them since the start. I saw them play 1 time with My Chemical Romance and Drive By at Madison Square Garden, and they were just amazing. They put on such a great show, and I am extremely excited to see them again. It would be the best thing ever, if I could watch my favorite music acts play together for free. I am also a big fan of Paramore, Bob Dylan, Kanye West, Nine Inch Nails, LilÃ¢â‚¬â„¢ Wayne, Foo Fighters, Duffy, KT Tunstall, Gogol Bordello, and pretty much everybody playing there. I would be so thrilled if I won this, and I have been so excited to go to this for a very long time.